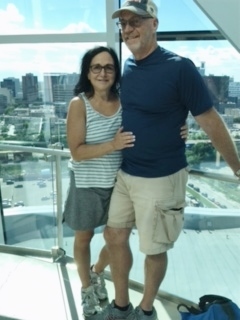 My wife, Robin, and I spent Wednesday at a wonderful museum in Winnipeg: the Canadian Human Rights Museum. It was remarkable by its thorough and historical discussion of human rights abuses around the world, but also by its humble inclusion of Canada’s incursions perpetrated within its own borders. For example, the Museum includes a deep and stirring examination of a “child welfare” system campaign in the 1960’s to “improve” the lives of Aboriginal (“First Nation”) children by removing them from their impoverished family homes and tribal communities and placing them far away in foster care — often with unmonitored and abusive families. Called the “60’s Scoop,” testimonies by these children and their parents, like all the exhibits, are a painful reminder of the consequences of ethnocentric thought. In fact, the Museum has been a watershed for criticisms in Canada. Groups that feel left out or minimized — i.e. their suffering did not receive fair attention in comparison with that given other incursions against ethnicities, races, religions, gender, LGBTQ communities, people with disabilities, and (an important debate in Canada) linguistic differences (i.e. French vs. English speakers). The Museum ends with a floor dedicated to a hopeful consideration of dozens of emergent leaders and voices in human rights causes, many of whom are remarkable for being “everyday people” who just want to make a difference. Despite its controversies, Canada should feel proud of its effort to document the path to human rights especially as nations like ours choose leaders with more isolationist views. The slope to indifference, bias, and hate can deepen rapidly should we fail to protect and defend our core freedoms. Wonderful you and Robin wre there. Yes, Canada should be ”Proud’ ! Volunteers who continued to visit the refugees in Canada. Over 5000 refugees were eventually admired to Canada where they and their progeny now live as proud, productive Canadian citizens. Apologies for the typing errors. The spark of that effort was the Immigration Reform and Control Act of 1986. Thank you for your writings. Always informative.